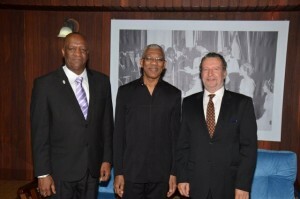 Minister of State, Mr. Joseph Harmon, President David Granger and Ambassador Lineu Pupo De Paula at the Ministry of the Presidency. Brazil’s Foreign Minister, Mauro Vieira is due to visit Guyana next week to hold talks with top officials here on a wide range of cooperation, the Ministry of the Presidency announced Wednesday. Brazil’s Ambassador to Guyana, Lineu Pupo De Paula Wednesday paid a courtesy call to President David Granger to update him on the arrangements for the visit of Brazil’s Foreign Minister, Mr. Mauro Vieira, to Guyana next week. The Ambassador said that the objective of this meeting is to enhance collaboration between the two countries. He disclosed that areas such as military and technical cooperation and issues relating to CELAC, UNASUR and other regional mechanisms, to which both countries are party, will also inform the agenda. 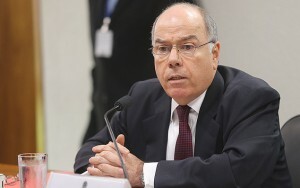 Brazil’s Foreign Minister, Mauro Vieira. “We have a lot of things happening. Today there is a border meeting happening in the Lethem-Bom Fim area with huge delegations from both sides,” the Ambassador said. He added that this engagement, along with the one that is scheduled for next week, is extremely important for both Guyana and Brazil.